When I sit back, close my eyes, and reminisce about college, I rarely think about saving money. Heck, back then I wish I had known some of these student money saving tips. Most college students are busting their butts in the classroom, working part-time (or full-time), and struggling to save any money. Back when I was in college I worked at a small local hardware store. I typically put in 20 – 30 hours a week and didn’t make a lot of money. The money I did make was poorly managed… at best. Poorly managed may be an understatement… to be honest, it’s a blur of buffalo chicken wraps and cheap beer. Now that I’m older and perhaps a smidgen wiser, I want to share some student money saving tips that I wish I knew back then. These student money saving tips will help you protect your bank account and decrease your anxiety around personal finance. You can save money, and it starts with these easy money saving tips! There are many student money saving tips out there, but learning how to plan, track, and control your spending is the most important one of them all! If you aren’t paying attention to your money, it will find a way to exit your bank account in a hurry. Trust your money like a five-year-old in a candy store. If you don’t pay attention to it, you’ll quickly find it doing something terrible. Creating your first budget shouldn’t be a stressful time. Budgeting is about planning where your money should go and controlling where it actually goes. To create your first budget you’ll need to list out all of your expenses, your income, and your bill due dates. If you’re unsure what your expenses are, you can export your monthly bank statements to excel and look back at the previous month or two. Review where your money was going, and decide where it should go next month. 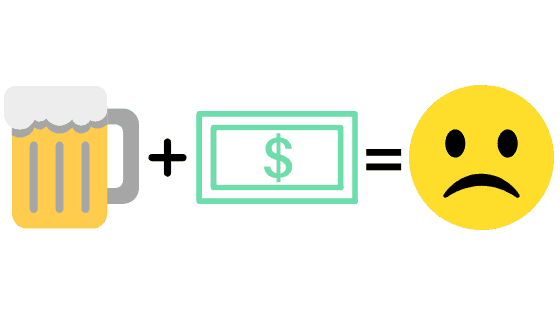 Allocate your income appropriately to each category and then track your spending every day. This free budget download will help you get started. Zero based budgeting is simply planning for every penny in your bank account. This can sound overwhelming, but it’s my personal budget of choice. When completing a zero based budget, your goal is to achieve $0 in your bank account at the end of the period. But wait, there’s something you need to know! 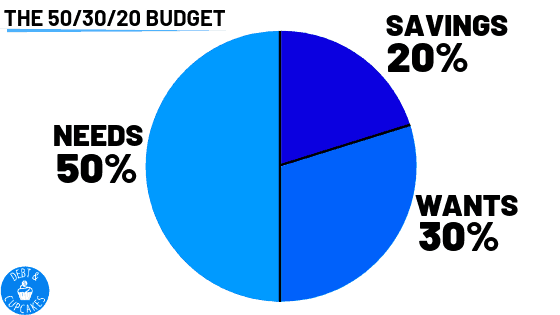 Budgeting to zero sounds terrifying, right?! For this reason, I suggest you leave a buffer in your account. Even if its $100, leave a buffer. Pretend that $100 doesn’t exist, and budget down to $100, or a figurative $0. You have $600 to spend over the next month. You’re going to pretend that $100 of that money doesn’t exist, so your budget is going to be based on $500. You’ll plan for 100% of that $500, and the remaining $100 will be there as a cushion should any mishaps occur with your spending. The 50/30/20 budget system, in my opinion, is a bit more complex and allows for overspending on unnecessary items. With that being said, it might work well for you. 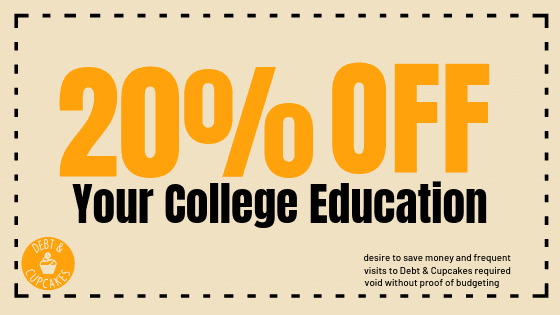 20% Savings – You’re a student saver, so you need to save money! I personally give this budget a bad rap because 30% is a lot of your money to go towards wants. If you’re seriously looking for student money saving tips, this probably doesn’t sound that appealing to you. Maybe all of this tracking and budgeting sounds too time consuming to you. If so, the 80/20 budget might be perfect. This budget is ultra-simple. 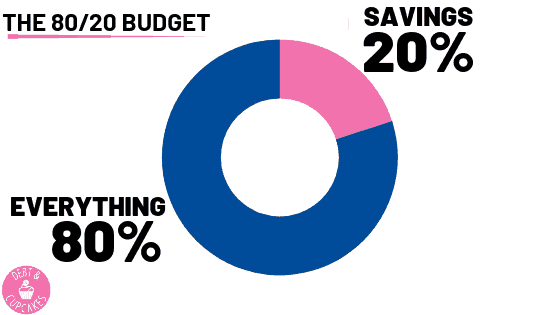 20% of your money goes toward savings and the other 80% goes toward everything else. I think this budget actually would work really well for a student saver. If you automate the 20% to go directly to a savings account you’ll quickly get used to living on 80% of your income or available money. The remaining 80% should be tracked and monitored closely so that it all doesn’t disappear on the first Thursday of the month. I love grocery shopping. It’s probably because I love to eat… either way, grocery shopping can either save you a lot of money, or spend all of your money. We’ve learned a lot about grocery shopping over the years, and all stores aren’t created equal. We were able to save 50% on our grocery bill by skipping the big names stores and shopping for 99% of our food at Aldi’s. If you don’t have an Aldi’s nearby… don’t fret! There are plenty of grocery stores around to help you save money. Each link above will help you locate a store near you. Don’t forget about your meal plan. You’re paying for that meal plan and it should be used to full capacity! Most college meal plans are set up in tiers. For instance, they may be classified as: light, medium and heavy. The light meal plan may offer you 10-14 meals per week (2x per day) and the medium plan may offer you the traditional 3 meals per day. If you’re paying for a meal plan that offers you 2 – 3 meals per day, you should use those or drop the plan entirely. This is one of the most commonly overlooked money saving hacks for students. Stop spending money twice on food! All the cool kids are couponing these days. For good reason too! Couponing can save you a lot of money on your grocery bill. Most grocery stores send out local flyers packed with coupons and other time sensitive sales. Too busy and short on time? Set aside half an hour every Sunday to review the local Sunday paper for relevant coupons. Only clip the coupons that you’re going to utilize and don’t waste time on anything else. It doesn’t take a lot of time, and it can help you save a lot of money! 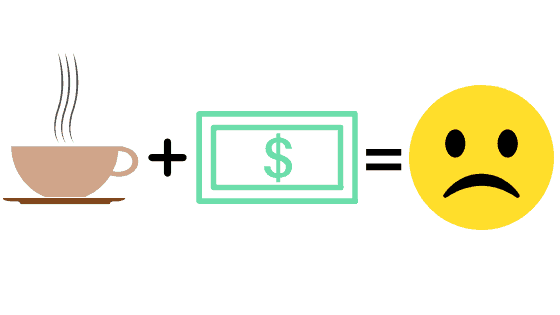 Ibotaa is a rather passive way to save money on your grocery bill. After you set up your mobile account, simple search the app for deals on items you’re already planning on purchasing. Once you finish up shopping, take a picture of your receipt, upload it to the mobile app, and cash out via PayPal. As we move down the list of student money saving tips, we can’t overlook your student ID. That tiny piece of plastic can save you a lot of money! There are a lot of places to get student discounts, and here are just a few. This is a short list of places that offer deals for college students. There are many more. College housing is expensive… Incredibly expensive. On average, public school students will pay almost $8.900 per year and private schools are paying just over $10,000 per year. Sweet mother of god… Your housing costs alone are going to stick with you for 20 years and cost you over $62,000!! There has to be a way for a college student to save money on housing, right? Getting a roommate (or 2) will drastically cut down on not only your rent, but all of the utilities attached with having a roof over your head. Make intelligent decisions when it comes to selecting a roommate. Pick someone who will pay their share of bills on time. Selecting the wrong roommate may end up costing you more in damages and lost deposits. Living at home isn’t exactly the sexiest decision to make, but if it saves you even half of that $40,000 housing cost… it’s totally worth it. Did you know most RAs receive free room and board? This could be the best of all the money saving tips for students. 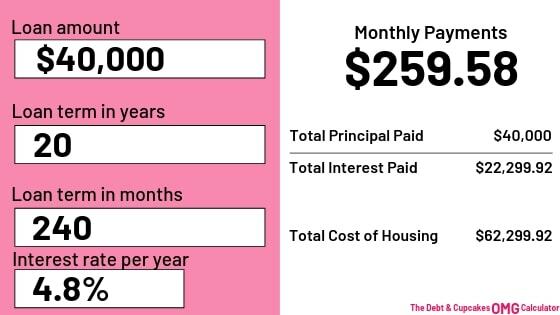 Sure, it might be slightly annoying to live in the dorms for years on end, but it could save you $40,000 or years of student loan debt! To become a RA, you’ll need to have earned at least 40 undergraduate credits and hold a GPA above 2.75 (at most universities). If you’re interested in becoming a RA, fill out your institution’s application and complete the necessary interviews. Your post college self will love you for making this decision… trust me! Another great student money saving tip is to utilize technology and avoid buying unnecessary supplies. I know… I know… A fresh notebook is oddly satisfying to buy, but your computer comes jam packed with digital tools to help keep you organized. I absolutely love OneNote. If you’re not familiar with this, OneNote is a digital notebook that’s built into the Microsoft Suite. You can create endless notebooks, tabs, sections, and pages in your digital notebooks. These notebooks can be backed up in the cloud. OneNote has become my best friend at work and if I were to head back to school, I’d save a lot of money in student supplies by utilizing this awesome resource. Books are incredibly expensive, and their resell value is pitiful at best. Another student money saving tip is to save money when you buy your textbooks. Buy used books online: Save up to 90% by buying books from one of the following websites! Ask your professor what books are actually needed. You’d be surprised how many textbooks aren’t required by specific professors. Dining out can bust your budget… quickly! If you’re paying for groceries and a meal plan, going out to eat should almost never occur. This can be difficult as peer pressure leads to a lot of poor financial decisions, but another student money saving tip is to avoid dining out like it’s the plague. Don’t fret, your social life won’t be impacted. Turn the table on the dinner out request. Ask to entertain at your place, and enjoy cooking with your friends. A student money saving plan can’t handle frequent trips to the bar. Drinks are expensive, and money becomes easy to spend when your inhibitions decrease. If you’re looking for a safe space to protect your money, I promise you… the bar isn’t it! Instead of heading to the bar, buy drinks and entertain at home. Not only will you save money, you won’t have to fight the crowds, drunk strangers, and it’s a lot safer as well! Skipping the bar is another tool in your student saver tool belt! Skip the coffee shop coffee and make your own at home. Coffee shops have become habits for many people (not just millennials). In 2018 people between the ages of 25-34 spent $2,008 on coffee! Holy moly, coffee shops are expensive! Skipping the coffee shop and using your meal plan to grab coffee will help you save money and avoid busting your budget. Having fun in college doesn’t have to cost a lot of money. You can save money and still have a good time with your friends. Research local events at your university. Entertaining yourself and your friends doesn’t have to be expensive! Of all the student money saving tips we discussed, this one is by far the most difficult. Learning how to say no will be a key to your ability to save money while in college. Peer pressure can lead to some expensive decisions and learning how to say no will be our last student money saving tip. If you’re in a crowd and everyone is agreeing to partake in an event that’s going to bust your budget, buy yourself some time. Politely state you’ll need to think about it, or that you need to check your calendar. Assure your friend that you’ll get back to them. This will buy yourself some time and allow you the luxury of chatting with your friend one on one. Don’t let peer pressure cause you to spend money you don’t have. Blindly shutting down your friends can lead to hurt feelings. If you’re not able to participate with your friends, explain why. You should be proud of the fact you’re saving money as a student. It’s possible your financial intelligence may spark curiosity among your friends. Wouldn’t that be a wonderful thing? 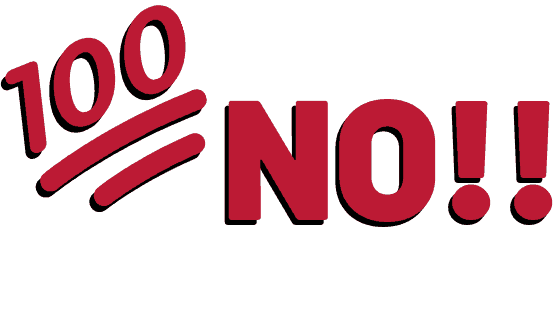 Your financially savvy ways could change the lives of your friends, and it would all start by saying NO. Saving money as a college student isn’t easy. Both income and time are low. You’re most likely operating with limited financial resources. With that being said, we covered a lot of money saving tips for college students and your financial toolbox is filling rapidly. Continue to prioritize your financial life and you’ll be light years ahead of the competition when you enter the workforce! Let us know how your money saving journey is going in the comments below! ⟵Debt Free With an Early 401k Withdrawal. When I was a college student, I wish I had my current FIRE goal as a guide b/c having a big Why is a great motivator. Now that I have college-age kids (one just out, one coming in) I can see the power of Why. My older one is a prodigious saver, and I think that’s largely b/c she has inspiring goals for her money — getting more wellness training, traveling internationally.